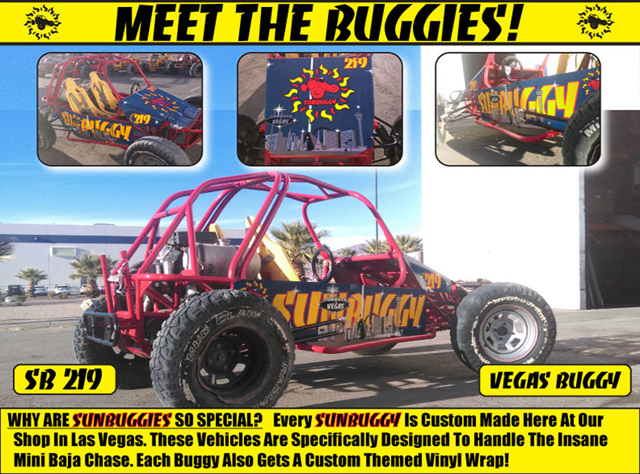 The Sunbuggy Mini Baja Night Chase that Rolling Stone Magazine deemed to be "Sin cities best near death experience" is now no longer just a day time activity. We equip our Mini-Baja Chase Desert Racer Dune Buggies with HIGH POWER LED LIGHT BARS to make this incredible night time driving experience possible with the thrills and adrenaline that has made many guests beg for more on our daytime runs! DRIVERS ONLY - This is a high intensity experience only open to our single seat cars! If this isn't enough, the desert scenery and the view of the Las Vegas Strip is breath taking! We dare you to experience the Mini Baja AD, this is 30 minutes of very scary desert chasing! Everyone must wear a full face off road helmet during their adventure. Pricing is all inclusive which provides for complimentary round trip transportation from your resort of choice anywhere in Las Vegas. Special Pick Up times may be available by request. This adventure is: 15,000 acres of varied high desert terrain, right on the edge of Las Vegas, only 15 miles from the strip. in the drivers seat, with a steering wheel! without a "Racing Driving Coach" sitting next to you telling you to slow down. includes helmet, goggles, gas, and cold bottled water (no extra extras waiting to surprise you!) Racers have a Full Roll Cage and 4 Point Harness. Pickup times are seasonal, currently they are 5pm, 6pm, and 7pm with later times available by request.